One of the many trends we have seen in cinema in recent years is adapting young adult literature. Ever since Harry Potter, movie studios have been desperately searching for that next big thing to attract young viewers. Some become a phenomenon (Twilight, Hunger Games) some fail completely (Beautiful Creatures, Eragon) and some manage to stay in that middle tier, not entirely a blockbuster, but certainly not a failure. It is in that middling area that the first Maze Runner movie, based on the novel by James Dashner, found itself. It didn’t break the box office like The Hunger Games, but it certainly did surprise many, and tripled its 34 million dollar budget. What was most impressive about The Maze Runner, however, was that it was a much better and different YA adaptation. Instead of force feeding us information through voiceovers, the audience was thrust in the middle of a mystery that even the characters in the film haven’t solved. Who is this protagonist? Where is he? Why is he here? What is his purpose? These were all questions that were organically answered throughout the film. With its second installment, Scorch Trials, the franchise gives us a lot of the answers we wanted as well as a lot more action, but do those things elevate the sequel above its predecessor? After narrowly escaping the horrors of the maze, Thomas (Dylan O’Brien) and his fellow gladers Teresa (Kaya Scodelario), Newt (Thomas Brodie-Sangster), Min Ho (Ki Hong Lee), Frypan (Dexter Darden) and Winston (Alexander Flores) have been picked up by a seemingly well meaning group of adult, led by the mysterious Janson (Aidan Gillen) and are transported to a facility with the promise of a safe haven from the dystopian environment they inhabit. Unfortunately, not long after they arrive, Thomas begins to suspect that he and his friends are probably better off facing whatever lies outside the facility than what is inside. One daring escape later and the gang is soon confronted with the dangers of a scorched earth including rabid zombie-like creatures called Cranks. They will also make new allies, including wandering mercenary Jorge (Giancarlo Esposito) and his adoptive daughter Brenda (Rosa Salazar). With WCKD (the organisation responsible for their misfortunes) hot on their tracks, Thomas and the gladers must use every ounce of courage, strength and skill they have if they want to survive the trials of The Scorch. I’ll start off by saying this: Scorch Trials isn’t as good as The Maze Runner. That being said, it’s still a great sequel that does an excellent job of expanding the world and mythology of the franchise. The main reason it doesn’t quite match up to its predecessor is that, despite following the same characters and storyline, they are two very different movies, and that’s not necessarily a bad thing; on the contrary I wish more movies would take that kind of risk, potentially alienating their audience by altering the structure of their franchise. The first film was a mystery movie, with bits of action spread throughout, Scorch Trials pretty much solves the mystery in its first couple of minutes and turns into a more traditional dystopian action plot: Apocalypse survivors must traverse a dangerous terrain to find a rumored safe zone. It’s actually not all that dissimilar in basic plot to the recently released Mad Max: Fury Road, except without cars and with teenagers. But the fact that its plot is not very original isn’t really bad here, primarily because the first movie did such a good job of making you care about these characters that the familiar elements don’t feel as boring as they would in a lesser movie. There’s always a way to make the familiar feel new, and The Scorch Trials does it. I cannot stress enough that you have to watch The Maze Runner if you want to enjoy Scorch Trials to the fullest. One of my biggest pet peeves with YA adaptations is that they always seem to follow the same clichés and tropes, the most annoying of which is a love triangle, something that was completely absent from the first Maze Runner. In fact it had very little romance at all which makes sense considering these kids barely have any idea who and where they are, let alone fall in love with someone. Unfortunately, there is a love triangle in Scorch Trials, but thankfully it doesn’t overtake the film like it does in the Hunger Games movies. In fact, it’s pretty much a tertiary part of the plot and resolves in a pretty shocking way. Despite being a movie primarily aimed at teenagers, it’s pretty brutal and doesn’t flinch from showing you a lot of violence, mature themes and even some swearing. I also enjoyed the fact that, again unlike most YA adaptations, it doesn’t present the villains as purely evil. There is a reason for their cruelty that makes you second guess who really is on the side of good. The cast itself is a mixed bag, with some actors appearing to have a lot of fun with the characters they are playing, and some looking just bored. Alan Tudyk in particular looked like he wanted nothing more than to not be in the film. It didn’t help that his character could have easily been excluded from the film, and the scene he was involved with (a weird rave happening in the middle of the Scorch where Thomas gets drugged) was by far the worst and most disjointed scene in the film. Kaya Scodelario also stood out as giving a lackluster performance, often appearing to channel Kristen Stewart’s somber, pouty look from the Twilight films. Thankfully, Dylan O’Brien holds his own as a charismatic male lead, and Giancarlo Esposito looks to be getting a real kick out of playing his anti-hero. 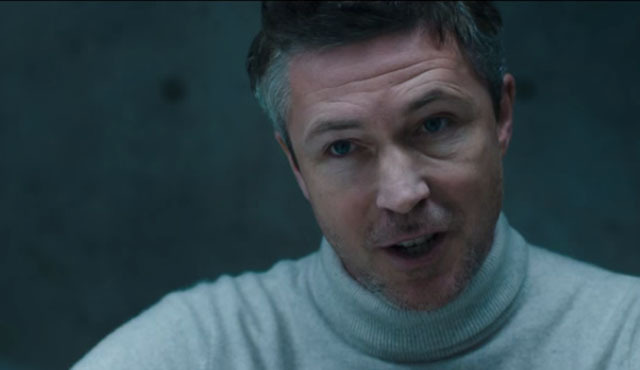 Aidan Gillen is his usual creepy self, clearly using all the tricks he has learned playing Littlefinger on Game of Thrones for all these years. His fellow GoT co-star Thomas Brodie-Sangster is also terrific in what little time he is given, as he functions as Thomas’ moral compass. The film’s environment is beautiful and you can tell they spent no expense in making the Scorch an empty, desolate landscape that befits the film’s dystopian setting. All of the many action scenes are intense and extremely well shot by director Wes Ball, who has a great eye for crafting tense chase scenes and putting characters in stressful situations (one scene involving a breaking floor window and a zombie stands out) and the climax is also a real nail-bitter as characters die and switch allegiances at a rapid pace. The only major problem I had with the action scenes is that there’s a little too much of them at the expense of character interaction, especially between the original gladers. The fact that the first film was much quieter and mystery-centric meant we spent a lot of time getting to know the characters through conversation. In Scorch Trials, Thomas and his friends barely have any time to talk before a new danger emerges and they must run away. Any time we do get scenes of long character interaction, it’s usually to further move the plot and give out exposition. I wish the film would have spent a little more time focusing on the friendship between Thomas, Newt, Min Ho, Frypan and Winston instead of focusing on the newer characters. That being said, there are some great emotional scenes in the movie, including some effective call-backs to the events of the first film. Though lacking the engaging sense of mystery that made the first film so surprising, Scorch Trials does manage to up the intensity of the Maze Runner franchise, introducing us to hazardous environments, horrifying creatures and truly nerve-racking set-pieces. The cast is filled with entertaining new-comers including Aiden Gillan and Giancarlo Esposito and the cliff-hanger ending made me wish the third and final installment would be available now. Scorch Trials does everything the middle part of a trilogy should do like expanding the world and offer something different than the first film, even if the dystopian world it presents to us isn’t exactly revolutionarily and the numerous action scenes prevent quieter character interactions from happening. You would be hard pressed to find today a YA novel adapted movie series better than this one, and for that reason alone, I highly recommend this film, and the franchise in general. Share the post "Maze Runner: Scorch Trials Review: Top of the YA Class"
← What Went Wrong With “Crimson Peak”?